Innovation and creativity can spring from unexpected sources. All three of these new books in Ford Library are recommended to anyone interested in opening their minds to new means of creativity and innovation. The knockoff economy : how imitation spurs innovation by Kal Raustiala* and Christopher Sprigman. On December 31, M.I.C. Gadget published the Top 10 Chinese Knockoffs of 2012. No surprise to find the iPhone and the iMac in the #1 and #2 positions, but #3 is the Steve Jobs knockoff, a wax figure clone of the official figure in Hong Kong. Copying electronic devices is a serious threat for Apple and other innovators, and patents and copyrights exist to protect them. Yet in a new book, The Knockoff Economy, two law school professors argue that in some industries, creativity thrives in the face of copying. In fashion, comedy and cuisine, copyright and patent restrictions do not apply, yet in all of these industries, creativity flourishes. Authors Raustiala and Sprigman analyze these industries to show how innovation can continue to thrive in an environment of imitation. *Author Kal Raustiala is a Professor in the UCLA School of Law and an alumnus of Duke University (Class of 1988, AB in Political Science). Little bets : how breakthrough ideas emerge from small discoveries by Peter Sims. Peter Sims also begins his new book Little Bets by discussing creativity in comedy, about how Chris Rock creates his standup routines by trying hundreds of preliminary joke ideas on small audiences before selecting a handful for a new routine on HBO. Sims calls this type of creativity “experimental innovation,” a persistent trial-and-error approach that gradually builds up to breakthroughs. This approach uses a discover-test-develop loop that refines results over time, and is especially valuable in an uncertain environment, or when solving open-ended problems. Failures happen often and are viewed as learning opportunities. While Sims notes that Google and Amazon use this style of innovation, he draws most of his examples from Pixar films at Apple and from architect Frank Gehry. Also available as an audiobook. The wide lens : a new strategy for innovation by Ron Adner. In The Wide Lens, Dartmouth professor Ron Adner explains that many smart companies and talented managers bring brilliant innovations to market with disappointing results. These failures occur even when customers value the products and are willing to pay for them. And they occur despite flawless execution; notwithstanding a focus on core competencies and despite beating the competition to market. These failures happen because the innovating companies do not recognize that they are part of an innovation ecosystem. Companies operate in an interdependent environment where success often depends on others. Innovators must align themselves with partners, suppliers, retailers, networks, distributors and other partners. Adner analyzes the risks, roles and relationships in an innovator’s environment and he explains how to reconfigure the ecosystem for success. Ford Library will be CLOSING at 4PM TODAY, Friday, January 25, 2013 due to winter weather and potentially hazardous driving conditions. Please follow the Library’s Twitter feed for the latest changes in our hours of operation due to weather conditions. Tweets showing changes in Library hours should also appear on our Hours & Directions web page, although it may not be updated as quickly as our Twitter feed itself. 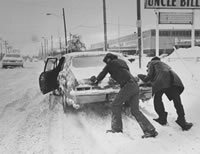 Please drive safely, and remember to check the links above to make sure we’re open before traveling into campus to visit Ford Library. Happy New Year and Welcome Back, students! Hope your winter holiday was full of peace and joy. And best wishes for much success in 2013. Classes begin next week, but before you get back to the grind, perhaps you can squeeze in some light and easy reading over the Martin Luther King holiday. Here are three easy choices from the Ford Library’s bookshelf, but there are many other new books on display in the library. Business journalist and personal friend of Warren Buffet updates her articles about the great investor, which were originally published in Fortune between 1966 and 2012, and which illustrate Buffett’s ideas about management, public policy and philanthropy. For those interested in grassroots organizations or social movements, this book is a sympathetic report on the earnest, leaderless, nonviolent and ultimately chaotic movement that was ridiculed daily on Fox News Channel shows like Bill O’Reilly. Former vice chairman of General Motors blames MBA’s for the automobile industry’s demise, explaining that bean counters sacrificed quality and reputation for easy profit. In this amusing and frank account of his years as an executive at GM, Ford, BMW and Chrysler, Lutz illuminates the arrogance and short termism in American industry and advocates that analysis-driven management be replaced by a focus on product excellence. Also available as an audiobook.